For most SaaS startups, the VP of Sales (along with the VP of Marketing) is one of the most crucial hires they need to make. Unless you have a no/low touch sales model and you're growing virally (a.k.a. you're successfully hunting flies or mice), someone needs to build a scalable sales organization, whether it's an inside sales team (a.k.a. hunting rabbits or deer) or a field sales team (a.k.a. hunting elephants). It's also one of the toughest hires. Jason M. Lemkin gave an epic talk about the subject at our 3rd annual SaaS Founder Meetup, last year in San Francisco. Jason also wrote extensively about the topic on SaaStr. If you haven't read his articles yet, make sure you read all of them. As Jason explained in this post, one of the things that makes hiring the right VP of Sales so hard is the timing. If you try to hire your "Mr. Make it Repeatable" or your "Ms. Go Big" VP of Sales too early, say at $500k in ARR, you'll almost certainly not get a great one. The reason is that a great one will most likely not leave his or her current position at a successful, fast-growing, well-funded SaaS company, which pays him or her hundreds of thousands of dollars in salary and bonus/commission per year, to join your tiny little startup. Starting to look for your VP of Sales too late is equally dangerous, though. If you want to grow roughly in line with the T2D3 formula, which most venture-funded SaaS startups should shoot for, you need to hire a lot of sales people in year 3. An exception are SaaS startups with a no/low-touch sales model and viral growth (see above) and potentially companies which have a massively negative net MRR churn rate and therefore don't have to acquire as many new customers. If you're fortunate to be in one of these categories, you may not need a big sales team, but most SaaS companies aren't. That's why I think most SaaS companies that don't have sales management experience in the founder team need to start looking for a VP of Sales by the time they're at around $1.5-2M in ARR so that by the time they're at around $2-3M, they've recruited a VP of Sales who can take them to $10M and beyond. My thinking becomes clearer if you take a look at this model, which calculates how many sales people you need to get from, say, $1M in ARR to $10M. Note that a big and productive sales team may be necessary to achieve that goal, but it's obviously not sufficient. You also need a great product, great marketing, etc. – otherwise your sales team won't have enough warm leads and closing them will be too hard. Click here to download the Excel sheet. Enter your current ARR in cell D10. You can of course also enter your ARR target for a future date, depending on what you want to calculate. In the template, I'm assuming that you're at or close to the end of year 1 and want to work out your hiring plan for year 2 and year 3. Enter the monthly growth rate that you're targeting for year 2 and year 3 in cells D11 and D12, respectively. Note that this should be your "net MRR/ARR growth rate", which takes into account all MRR movements like churn, expansion or contraction. The sample data that I've put in reflects the T2D3 formula (grow to $1M in ARR in year 1, triple in year 2 and triple again in year 3). Input your monthly net MRR churn rate (i.e. [churn MRR plus contraction MRR] minus [expansion MRR plus reactivation MRR]) in cell D13. Using these inputs, the spreadsheet will calculate the new ARR from new customers that you have to acquire in order to meet your growth targets. See row 25. Your AEs' quota, i.e. how much new ARR you expect each AE to bring per month. The model assumes that your AEs will on average meet their quota. In reality, some of your sales people won't meet their quota and some will exceed it, so this number really is just the average which you expect to achieve. Ramp-up time, i.e. the time it takes your AEs to reach full productivity. The model assumes that they're 100% productive in month 4. For months 1-3, you can enter different percentages in cells G10-12. The size of your sales support team. In cells K10-14 you can enter how many Sales Directors, SDRs and SDR Directors you expect you'll need in proportion to the number of AEs. The sample numbers that I'm using in the template are broadly in line with the results of this benchmarking survey. As you can see in the spreadsheet and in the chart, based on these assumptions your total sales headcount increases from 2 to 9 in year 2 and from 9 to 30 in year 3. So in year 3 you'll have to hire and train 21 new sales people (plus replacements for people that leave or are let go). Without a VP of Sales who has built and scaled a sales team before, that's tough. 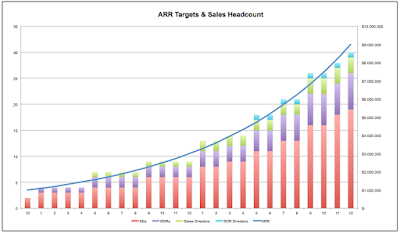 PS: As you can see in the chart below, there's a 1:1 correlation (approximately) between ARR and sales headcount. 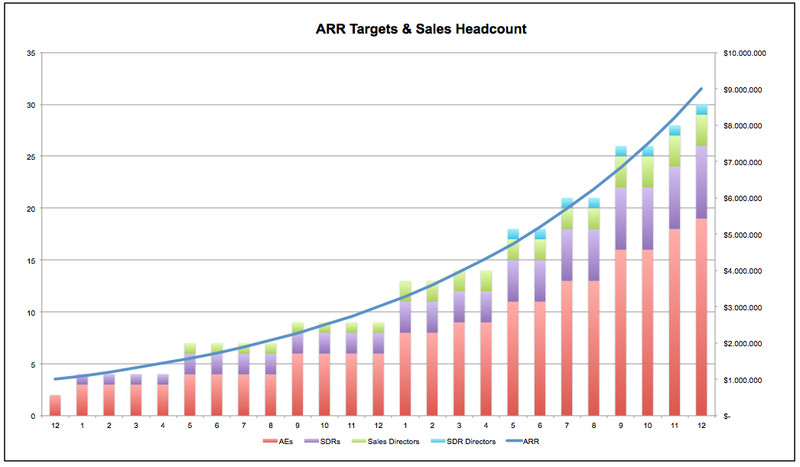 That's OK in the $1-10M ARR stage, but in the longer term the best SaaS companies manage to grow revenues faster than sales spendings, primarily by focusing on account expansions to achieve an ever-increasing negative MRR churn rate and by continuously getting up sales efficiency. When founders reach out to us to pitch us for an investment, they usually have a fundraising deck which they’re happy to send over. But every so often it also happens that a founder wants to set up a call or a meeting before sending over any material. 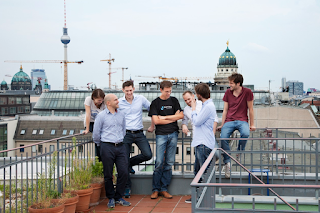 In these cases I usually ask the founder if he or she could send us a deck first, with a view to have a call or meeting as a potential second step. But every time I do this, it makes me feel uncomfortable because I don’t want to come across as impolite, arrogant or unapproachable. In this post I’d like to give some background on how we work, which will hopefully make it easier to understand our behavior in the scenario I described above. I have understanding for founders who want to walk us through their story and vision rather than sending over some slides. A startup is a founder’s baby which they often have a deeply emotional relationship with, and it’s understandable that when they pitch it, they want to leave the best possible first impression. It’s also understandable that founders want to get to know us first and learn more about us before sending us confidential information. What’s more, most founders are very smart people who are great to talk to. For all these reasons, I wish we could talk to all founders who reach out to us. But it’s impossible. In the last 90 days we’ve logged 987 potential investments in our Zendesk (which we use for deal-flow management). 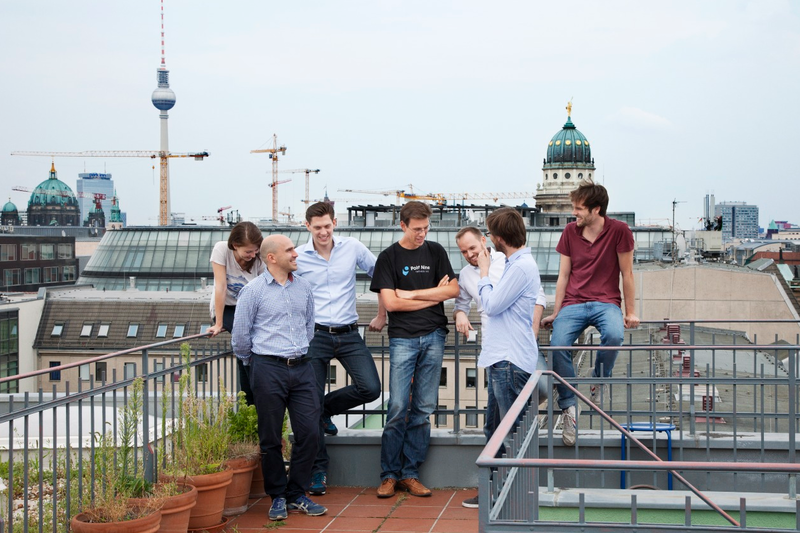 Even with three Associates and one Intern, we can’t talk to all of these startups. If we did, we wouldn’t have enough time to dive in deeply into sectors, do due diligences, spend time with our portfolio companies and do many other things which are important for our business. This is why using the pitch deck as the first filter is so important for us. When we go through a deck, a couple of minutes are usually enough to determine if we want to learn more. There are plenty of reasons why a company may not be the right fit for us (and Point Nine not the right partner for the company): It may be too early-stage or too late-stage. It may be a sector we’ve looked at before and aren’t excited about or it may be an area which we don’t have any expertise in. Or it may be in a field that’s too close to one of our existing portfolio companies. Most of the time when we pass quickly after having seen a deck, it doesn’t say anything about the quality of the startup and only means that the company is outside of our investment focus. Obviously our process isn’t perfect. Not taking a closer look at each incoming request means we will miss great companies (and grow our anti-portfolio). But the same is true for any other approach. I know that most other VCs feel the same about this, so if you want to raise money, spending time on producing a great pitch deck is time well spent. I also think that creating a deck is a great exercise because it helps you think through each area of your business systematically. Michael wrote a great post about “What should be in my fundraising slides”. Don't send your pitch deck to dozens of VCs. Do your research to find out which 5-10 firms look like the best fit for you and start with those. You don’t have to include everything in your “teaser” deck. I would recommend to include KPIs in the deck, since these are crucial for the investor to determine if you’re at the right stage, but it’s perfectly fine to leave out sensitive information like details on your product roadmap.